This patient presented with severe right upper quadrant pain and the ultrasound confirmed an inflamed, stone-filled gallbladder. But it gets more complicated. I noticed her Liver Function Tests were abnormal. This can often be seen just in simple acute cholecystitis but it also ought to alert one to the possibility that the patient has passed stones into the common bile duct in which case it is prudent to clear the duct prior to surgery with an ERCP (endoscopic retrograde cholangipancreatography). This woman's bile duct was only 3mm on the ultrasound, well within the range of normal, so I sent her for an MRCP (yes, I use expensive imaging tests occasionally) in order to further elucidate this apparent discrepancy of abnormal liver tests in the setting of a normal sized duct. The MRCP demonstrated no filling defects. But it did show some unusual anatomy. If you look closely at the images above, you can appreciate that the common hepatic duct branches into right and left ducts much lower than normal. The cystic duct off the gallbladder inserts very close to this bifurcation. This sort of anatomy makes surgeons nervous. We like long thin cystic ducts located far from the main bifurcation. So I brought the patient to the OR knowing this tidbit of information. And I proceeded very slowly. For one thing, the gallbladder was a friable, edematous piece of wet cardboard. Adhesions from the infundibulum to the porta hepatis region were more intense than I like to see. I peeled connective tissue away strand by strand, gently dissecting with the laparoscopic forceps. Ultimately I was able to heft the bulbous infundibulum up and out of the porta hepatis. Voila----cystic duct, on some tension, the only thing left connecting the gallbladder. 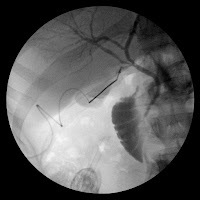 The cholangiogram I shot is included in the images above. What you see is some narrowing of the distal right duct, presumably secondarily from the inflammation of the adjacent gallbladder. But I definitely had the cystic duct dissected out and isolated. It was safe to clip and cut. These sorts of gallbladders can be hair raising. But the more prepared you are for a case, the more information you have, the better you're going to be able to handle it. An MRI is expensive but being able to correlate my intraop cholangiogram with the pre-op MRCP pictures was invaluable. Actually - I think your cholangiogram and the MRI show the cystic duct either coming off the the right posterior sectoral duct or right at its junction with the right anterior and the left duct. Pretty classic aberrant anatomy of a variant of the cystic duct coming off the right system. Either way - it is one of the problems of "routine gallbladder surgery" that ups the pucker factor. 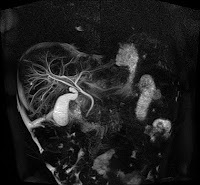 BTW - you have a better MRCP radiologist than I have - that is a terrific MR image! I thought that initially too but when you look at all the images together, that's actually the right duct. At least that what my radiologist (very good btw) avers. radiology to the rescue!! actually that's a damn good looking mrcp, nice work your rads are doing over there. Did you have any thoughts about doing the case open, given the abnormal anatomy? My threshold for converting was going to be lower...but no reason to start open until you see what youre dealing with.